GPS will get you anywhere in pursuit of good food, which is how we find ourselves on a gorgeous night in Winthrop at Blackstrap BBQ. Everything on the blackboard sounds irresistible, so hungry travelers that we are, we order what seems like half the menu. A generous stack of buttermilk fried onion rings ($4.99) arrives right away, and one bite of these sweet, juicy rings with their nearly crackly crust and we’re smiling as more food starts coming. Will there be enough? After fried pickles ($2.99) with ranch dressing, crusty on the outside and all pickly inside, then deliciously, juicy fried green tomatoes with vegetable salad and remoulade dressing ($6.99), and crisp fries that stay crisp throughout dinner, we’re about to hand out a deep frying award. Hunks of cornbread ($1.50), tied in waxed paper bags, are dense and sweet, something like pound cake. “Bad, tastes like cake’’ says the gentleman to my left. “Fabulous,’’ says the woman to my right. “Of course it tastes like cake.’’ They don’t have a chance to launch into the North-South sweet vs. unsweetened cornbread debate because someone sets down a bowl of Grammy Kath’s Rip Your Lips Off Chili ($4.99 and $6.99). Its dark and luscious liquid is sprinkled with cheddar and onions. The chili, simmered with chunks of pork and beef (no beans or tomatoes), is pleasingly hot rather than alarmingly so. We all dip in spoons until the cup is scraped clean. Sticky BBQ chicken wings ($5.99-$16.99) are plump, smoky, and succulent. At this 22-seat spot (primarily take-out), you order at a counter and food comes in plastic containers, foil-lined paper boats, and plastic baskets. Napkins are so thin we use dozens and break at least two plastic knives trying to divvy things up. Thompson, who is from Middlebury, Vt., spent a lot of time in Virginia. “A lot of barbecue,’’ he says. “A lot of church parties.’’ To that end, his Carolina-style pork ($12.99 for a plate with sides; $11.99 for a pint) is a tender, saucy cluster of barely sweet meat; shredded BBQ chicken ($12.99 plate; $11.99 pint) isn’t as rich as the pork, of course, but deliciously saucy. And now to the highlight of the menu: Memphis-style dry-rub pork ribs ($2.99 for one bone, $12.99 for half rack; $23.99 for full rack). You get a smoky sauce in which to dip the ribs, which are center cut and meaty, smoked over cherry and local hardwoods until the pork is intensely flavorful but still moist. Almost forgot The Hog ($6.99-$10.99)! It starts with sausage, which is wrapped in bacon, smoked, then fried to crisp the bacon. Order it with peppers and onions, or get a Cowboy Hog with baked beans and slaw. There’s so much going on here, you could feed a family of four. The molasses beans are exquisite, the slaw creamy but not too sweet, the hog a big mess of meat and smoke. The cooks here know how to add smoke without hammering it into everything. A sweet potato salad ($2.50 half pint) has a hint of it and a creamy dressing that perfectly suits it. A few shreds of bacon enhance long-cooked collards ($2.50 half pint). Dinner ends with a chocolate pecan square ($2.99) and cornbread pudding with Cruzan Black Strap rum, which the owners abbreviate as “BS rum’’ ($3.99). The sweets are a little rough and ready, but just what you want after all this smoky, sticky, immensely satisfying food. On the way home, even the robotic voice giving directions on the GPS sounds as if she’s had a good time. 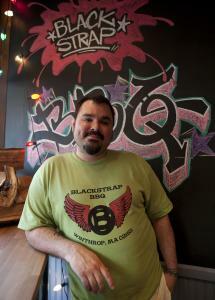 47A Woodside Ave., Winthrop, 617-207-1783, www.black strapbbq.com. MasterCard and Visa. Wheelchair accessible. Prices Appetizers $2.99-$6.99. Plates and sandwiches $6.99-$23.99. Desserts $2.99-$3.99. Hours Tue-Thu 11 a.m.-9 p.m.; Fri-Sat 11 a.m.-10 p.m.; Sun 11 a.m.-8 p.m.
May we suggest Smoked chicken wings, pork ribs, Carolina-style pork, fried green tomatoes, buttermilk fried onion rings, chili, baked beans, cornbread pudding, chocolate pecan square.